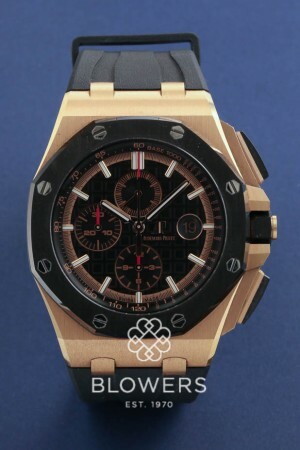 18ct Rose Gold Audemars Piguet Royal Oak Offshore Chronograph 26401RO.OO.A002CA.02. 44mm Rose Gold case which is water resistant to 100 meters. Automatic AP Calibre 3126/ 3840 movement. 21,600vph, 59 Jewels, 50-hour power reserve, 365 parts. Black Tapisserie dial and applied index hour markers and rose gold ringed sub dials. Black rubber strap with18ct pink gold pin buckle. Box and papers dated April 2017. SKU: 30-88-132. Categories: Audemars Piguet, Royal Oak Offshore.